This post is probably a little predictable for the time of year as most of us will have exams looming closer and closer – which is the reason this post has taken ages to write because of revision and everything else. I guess instead of posting this I perhaps I should be doing more and perhaps you’ve just been distracted from your revising too? Now, you'd think with this is my third year of taking exams I'd know how to 'revise' but if there is one thing they do not teach you, it’s how to actually revise. Here’s a text book, learn everything. Our brains just do not work like that, as much as I’d love to be able to read a text book and remember everything in one go, it doesn’t happen. I guess we are all different and learn if different ways. Some of us learn by doing, some by visuals and some by audio. 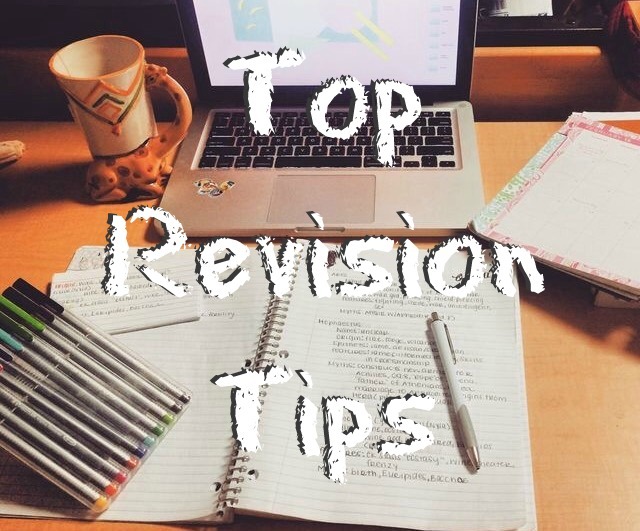 I’ve decided now is probably a good time to pass on my somewhat helpful tips and tricks for revising, so I hope you find this post helpful and good luck with your exams if you have them coming up! (PS. If you don't want to read it all and would prefer something more visual watch the video on my channel which is pretty much the same advice). This is easier said than done for most, but I’ve found that if I don’t plan revision and timetable it in, it just never gets done. Its always best to have a diary with everything in from school plans, work or anything social with friends. It makes things easier when putting together a revision timetable. I do it on Excel and colour code it all so it’s clear when I’m doing what. I add in my school timetable, free periods and when I have my weekly work shift and then build a schedule around that. It really works for me and I’m more likely to do it if I schedule stuff! Make sure you make time for breaks though – I do an hour of a subject, then a 15 minute break, and carry on like so. Make sure all your notes are organised too! I only do 3 subjects as I'm currently doing A-Levels but there is a lot in each subject, so by making sure you have the correct equipment is always a massively helpful. DON’T ever ever sit at your desk just staring at a book hoping the facts will jump into your head because they really won’t. And, you’ll have wasted time you could have used learning something productively. So make revision cards, mind maps even make songs up if it helps… the more creative you are the more likely it will stick in your brain. I always find rhymes worked really well, especially for English which is a really full on, wordy subject! Do it. Bug them until they give you resources, get them to mark your past papers and ask them for help. They’re getting paid for it so you may as well utilise them. They’ll also know what the exam entails (hopefully!) so ask them to mark paper – harshly – so you’re prepared. Even ask if they can do after school sessions if you feel that would be beneficial. Make your bedroom walls a noticeboard during exam season. I stick post-it notes with quick facts on my mirrors so whenever I'm getting ready I read them as I go and I make spider diagrams on A3 paper and have them around my room. I make big mind maps of everything, and fill it up with notes and posters. It works! That’s right, get rid of phones, computers and anything else that will distract you during revision. Put them away until you’ve finished your revision time. I tend to switch my phone off and put it in a drawer in my room whilst I revise down stairs therefore I'm not tempted to have a quick look. This sort of works. It works well if you and your friends do the same subject but careful you don’t just start nattering! Get together on a weekend and do mini quizzes to test and help each other. It’s good because you teach each other stuff whilst consolidating what you know. Or even on an evening video calling your friend is to help revise is another good thing to do. Revision gets intense and can take its toll. Give yourself regular breaks to stop your head exploding. Go completely out the house, have some food, fresh air or some exercise. It will refresh your mind making it easier to revise more! Make sure you get plenty of sleep too, the more tired you are the less likely to are to take things in, espeically the night before exams.